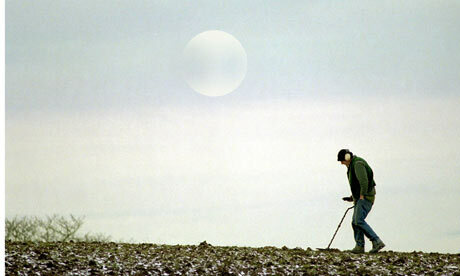 Metal Detecting Filling the Gap Left by Reduced Funding for Archaeology? As the money that funded an unprecedented explosion of professional archaeology during the economic boom years runs out, public hunger to peel back the past beneath our feet is helping to fill the gap. So the grots are identifying lost villages and settlements, Roman forts and temples, previously unknown trade routes; even mapping the slow ebb of the Roman empire from Britain. By law, you must have a licence to excavate or remove even a pebble from a scheduled ancient monument or listed building, and all treasure finds anywhere must be reported. But anyone can pick up a metal detector – there are an estimated 180,000 in Britain – and take it into a ploughed field with the permission of the landowner. Fired by an unprecedented public interest in archaeology, thousands of people are doing just that, and the finds they report, often almost worthless in terms of cash, are proving true treasure. The grots have only been reported since 1996, when the PAS began establishing a national network of finds officers, to record and crucially map all the archaeological objects found by amateurs. The scheme has gradually forged a truce between most career archaeologists and the metal detectorists many previously regarded as little better than looters. Reports of finds from bronze-age arrows to second world war cap badges are now running at 50,000 a year. Gradually, the detectorists realised that the archaeologists were interested in the rubbish in their grot pots. This week the scheme recorded its 400,000th object, a classic grot from Lincolnshire that has turned out to be a fabulously rare coin. For my thoughts on the PAS, see here. For a published examination of how we might apply the PAS and some of its policies elsewhere, see here.